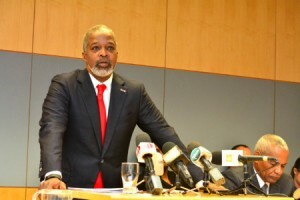 WILLEMSTAD – The Minister of Finance Dr. Jose Jardim must retract his statement about the suspension of the President of the Central Bank of Curaçao and Sint Maarten Emsley Tromp. According to Tromp’s lawyer Mirto Murray there can be no question of a suspension, as this is possible only on the recommendation of the Supervisory Board (SB). The board has not made such a decision, and moreover, a majority of the commissioners think that such action is premature. This is according to a report from the Dutch newspaper Antilliaans Dagblad. Minister Jardim, through his lawyer Mayesi Hammoud, responded, as requested, within 24 hours. He did not respond with the requested correction, but by pointing out that the suspension was a way to put things in order rather than a disciplinary measure. Presumably, the parties will meet to discuss this issue based on Jardim’s statement. Tromp and his legal counsel want the proposed suspension of the table. The President of the CBCS is willing to continue his announced vacation as long as the investigation of the Public Prosecution (OM) is kept in a private sphere. Lawyer Murray gives little commentary, according to the Antilliaans Dagblad. “We want to try to get out of the impasse in the interest of the Central Bank. At the moment I can only say that the suspension does not exist; that there is no decision to suspend.” The required recommendation of the supervisory board is not there. And two of the three commissioners believe it is too premature for this decision. Last week Thursday, however, Minister Jardim announced that Tromp would be suspended. The CBCS President himself knew nothing about this decision. He had to find out through the media.